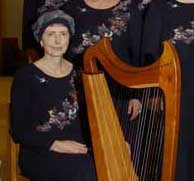 On Dec. 23, 2003, ASTER lost one of its much loved members, Ione Caley. She contributed so much to the organization and the group loved her dearly. We will miss her greatly. When my father died in March (2003), we decided to put off his memorial service until his birthday in May. I called Ione one evening to see if she had any music that might be appropriate to sing at his memorial. She said she’d look through what she had and get back to me. She called me the next morning and sang through each piece she had found (and there were many!) and then faxed them to me. What a treat it was to have Ione sing to me at 9 AM!